Is there any setting anyone knows of that stops the phone from creating/maintaining this folder on the SD card? I regularly import my photos from my phone to my computer using the import wizard from an older version of windows. It searches the whole device and then tells me how many new photos it found. The issue I'm having is that my S9+ is maintaining this Android/data folder on the SD card, with a TON of tiny files inside of it. When I use the importer app I have to wait a couple of minutes for the app to sort through all of that junk before it starts actually importing photos. This is why I am hoping to get rid of this folder and have it never come back. I want to use the SD card for photos and videos only, no app data. The SD card is too slow for app data anyway. Regardless of where those folders are saved, the Windows Explorer Import Pictures & Videos is still going to import all image and video files from anywhere on the phone (including cached media files used by apps). I never use that feature, because it's completely indiscriminant. I suggest using Windows Explorer to manually select the photos you want to transfer. Its empty folders. Until you move data. Pointers. Symbolic links. Taking 0 bytes. It's not apps. You can point apps to use SD card for data in some cases. Your best sdxc can read at 170MB and writes at 90. Most common sdxc though have slow 30MB or less writes. So copying files will matter when sync or copy. You examined the Android folder and subfolders before getting upset to see? The .Android Secure has data that you told each app to move to SD and vary depending on how much data there was. Mine is small, less than 1GB. I haven't really looked through the folders much but I tried deleting it and many new folders were created as soon as I left the my files app and re-entered it. So it's definitely using that folder when I'm not trying to have it function that way. I removed my SD card and realized I was telling Spotify to save to my SD card. I turned that off though and re-inserted the SD card, then formatted it, and immediately after doing so the Android/data folder already had ~6 subfolders. Without Spotify saving there the actual size of the folder was very small. Even if the size of the folder is small though, if it has enough subfolders it may still slow down the windows import process because SD cards are really slow with reading multiple files. The 170MB read 90MB write is for large files. A bunch of smaller ones will yield dreadfully slow transfer rates. 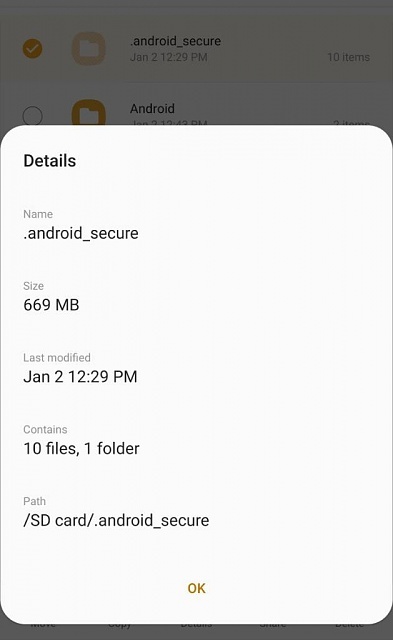 What app did you use to show how much space is in the .android_secure folder? I'm unable view it from any of my Android file managers, since it's a hidden folder. You really need to stop using that old Windows app. I haven't found anything that is better at organizing photos. It is really useful for that. I can put all of my photos in folders dated YYYY-MM-DD so that the folders sort by the date the photo was taken. Copying my photos manually and maintaining that organization is more work than just waiting for the program to sort through all the weird crap in the SD card.